Tyler Brûlé—editor, tastemaker, mini media mogul—is sitting in the bar at the Crosby Street Hotel drinking from a pretty bottle of bubbly water. There is nothing in his appearance or his demeanor, both of which call to mind an exceptionally relaxed Clark Kent, to suggest that he is merely between long-haul flights to places like Rio and Seoul. Everything about him communicates health and ease, with himself and with his surroundings. He can, after all, claim a certain amount of credit for the environment he finds himself in. Brûlé is the man who created Wallpaper magazine, back in 1996, and with it a generation of urban designophiles in clever glasses who know their Jean Nouvel from their Andrée Putman and who like their hotels exactly like this one. The manager waves across the room: Is there any better endorsement than Tyler Brûlé? In the morning Brûlé (as in crème) will be off again—he’ll check in someplace else similarly well-lit—but for the moment, he is focused as can be on the topic at hand: old media. He loves it. Can’t get enough. “I don’t want to sound like a Luddite about it,” he says, “but …” But Brûlé sort of is. Not a Luddite, exactly, but a hard-core devotee of old-fashioned media: of magazines that are printed on paper, of news programs that dedicate hours to single topics, and of well-modulated, unhysterical coverage of things other than, as he puts it, missing white women. As the media conglomerates of the world attempt to figure out their plans for the future, Brûlé is hatching a tiny and very specific media empire from a lovely part of Central London called Marylebone. At its core is Monocle, a ten-times-a-year journal published in the U.K.—but with “bureaux” in Tokyo, Hong Kong, Zurich, and New York—that covers everything from development in Maputo to a spectacular little shoe shop off some Strasse in Baden-Baden. Launched in 2007 and bearing the tagline “A briefing on global affairs, business, culture & design,” it wouldn’t at first glance appear to be the kind of publication destined to survive a Great Recession. The magazine is, in many ways, in distinct opposition to the prevailing winds of culture: It cares next to nothing for celebrities. It’s earnest rather than ironic. And perhaps most touchingly, it keeps wanting to unearth success stories—or to proffer advice for companies and countries that could use a bit of a rethink. As high-flying as its tastes can seem (“It’s official: The Koreans do the best hotel gyms”), Monocle also exhibits a deep curiosity about the state of infrastructure in big cities and small towns. About public housing. About measures to improve traffic safety in La Paz (hiring youths in zebra costumes had a strangely beneficial effect). About the efforts of Tbilisi to transform its skyline. It assumes its readers are every bit as interested in the goings-on at city hall in Belo Horizonte, Brazil, as they are in understanding how Afghan drug lords have destroyed the temples of a desperately remote town. It also assumes they’re eager to know where to get excellent toiletries in Zurich and delicious margaritas in Beirut. And the Monocle staff live that way, too. One spring day in London, three of Brûlé’s deputies are at lunch at Dean Street Townhouse, the trendiest restaurant in the city right now, sipping glasses of white wine and comparing their Brazilian tans—they’ve all just gotten back. Because as much as Brûlé likes design, what he really likes are things that work spectacularly well: He likes high-speed rail travel, and he likes the first-class cabins on Singapore Airlines. He likes Asian newsstands. He doesn’t love New York as much as he might if we had some high-speed rail travel of our own, particularly to the airport, and also if our street lamps weren’t so god-awful. In many ways, Brûlé, 42, has become the gold standard of what is currently considered modern “good taste,” a Martha Stewart for the global elite (like Stewart, he inspires acolytes and parodists). Just look at what Wallpaper unleashed. If he thinks there’s a future in fragrant print, elegant TV, and soothing 24-hour radio talk shows, well, maybe there is. Brûlé is Canadian, which could explain the penchant for practicality. (The accents are not, by the way, an affectation, as has been widely assumed; they have been in his family for generations.) His father was a football player, his mother is a painter, and all he ever wanted to do was to be like his Canadian idol: Peter Jennings. “I wanted to read the evening news,” he says. And my God, does he have the voice for it: deep, modulated, reassuring. He didn’t really consider himself a writer, but he went freelance and made a splash with an article about decadent teenagers driving their Ferraris to the beach in Beirut. In 1994, he was sent on assignment to Afghanistan for Focus, a German news magazine. Back then, Afghanistan was a different kind of rough, but it was rough all the same: The Russians had pulled out, the Taliban was not yet in power, and the country was ruled by seven warring mujaheddin factions. He went back to London to recuperate, a period spent perusing lots of home-design and cooking magazines. But they were all hopelessly mundane. He started to dream about a new magazine. “It was a reaction to wanting to live every moment,” he says, “to be a little hedonistic.” He took out a small-business loan and launched Wallpaper in 1996. It quickly got bought up by Time Inc. At that point Brûlé disengaged a bit; the corporate life was not his style. There was a dispute about expenses—some say it was over a receipt for a London cab, others say it was over the receipt for a private jet, but at any rate, it wasn’t working out. 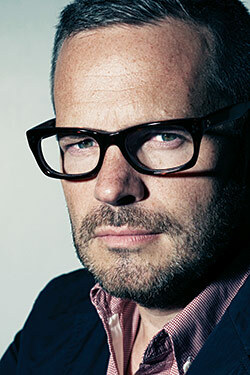 A noncompete clause in his contract meant he couldn’t publish another magazine for two and a half years, so he focused his attention on a branding and advertising agency he’d started called Winkreative, which he still runs and which has counted among its clients companies like Toto, the high-end Japanese toilet manufacturer. Brûlé also lived out his noncompete by going back to a series of binders he’d filled, over the past twenty years, with his favorite clippings from all sorts of magazines: a column by the Village Voice’s Michael Musto here, a shoot from German Vogue there. One day, toward the end of his noncompete, a Spanish branding client asked him why he had so many empty desks, and he explained that he was planning to launch a magazine when he was again able. The client, the matriarch of a wealthy family, offered to invest, but only if the other investors were in similar situations. And so Brûlé assembled a group of five family foundations, each from a different country, to finance the project—in combination with the income generated by Monocle shops selling the harder-to-find items from the pages of the magazine (ecofriendly Lebanese stationery, a perfect Korean tote bag, a limited-edition Finnish milking stool). In addition to the store here, there are outposts in London, Los Angeles, Tokyo, and Hong Kong (“in Bo Fung Mansion! How great is that?”), and they also sell such things as Monocle-branded bags from Porter. Eventually, he’d like to have shops all over the world, with foreign bureaus in the back. 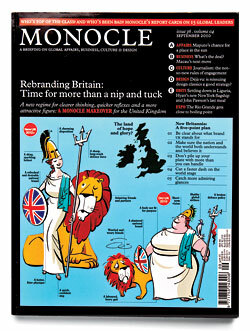 Three years after its launch, Monocle reaches roughly 150,000 people. Subscriptions are up 35 percent from last year. Its 16,000 subscribers pay £75 a year whether they live in Paramus or Paraguay. “We didn’t think you should be penalized because of where you live,” he says. One of its mainstay features is the urban survey: A hunk of Monocle’s staff will decamp to a foreign city, hire freelancers, and set about the task of documenting life there. As for their news coverage, “we wanted to focus on two things: either be there first or be in pockets of the world that people aren’t in today. If you want to read a story by an embedded journalist, you’ll go somewhere else, but we had a story on narcotecture in Afghanistan,” a tour of McMansions built for the new rich. In 2007, the magazine sent David Usborne to Alaska on a hunch. He’d seen Sarah Palin and thought she was odd enough to merit an interview. A magazine must know its reader. But does anyone other than Brûlé actually live this life? It sometimes feels as if he has gone to extensive, even comic lengths to brand himself. In addition to his work at Monocle, he writes a column called “Fast Lane” for the Financial Times in which he documents various aspects of his existence. The tone can be so over the top (a column about self-improvement included this sentence: “With a little more work, we were able to get my trainer Vivi over from Switzerland for early mornings at a private gym in Fitzrovia, and some calls to friends at the Foreign Office helped us track down an Arabic teacher who could do private classes straight after the gym”) that a reader once semi-facetiously wondered if the whole thing was just a put-on. But fantasy has long been a component of great magazines. And one of Monocle’s enduring fantasies is that the world is still, despite it all, a rich and exciting place.